By Salbinous Saribun WEDNESDAY, 13 APRIL – Senior Lecturer from the Faculty of Business, Economy and Accountancy (FPEP), Universiti Malaysia Sabah (UMS), Dr. Awangku Hassanal Bahar Pengiran Bagul received the Golden Globe Tigers 2016; Leadership Award for Excellence in Social Innovation. Dr. Hassanal was selected to receive this award from the Asian Confederation of Businesses for his involvement in various programmes related to sustainability such as the community-based ecotourism, and most recently on campus sustainability. When met, Dr. Hassanal said he was indeed surprised to win the award as it had never crossed his mind to to be the recipient of the prestigious and internationally standard award. “I have always sincerely work for sustainability and did not expect this effort to earn any interest. “I am grateful to have my family and colleagues as my driving force and to always strive to do my best. Also to UMS, where my career continue to advance, thus improving myself and the work that I have done in my field,” he said. 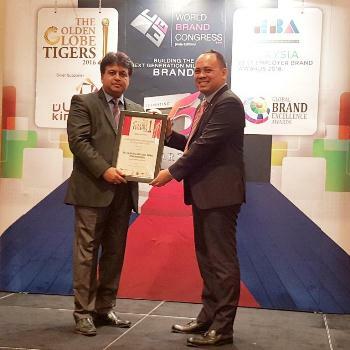 Dr. Hassanal received the award on Monday at a ceremony in one of the leading hotels in Kuala Lumpur.